It's a stormy, miserable day in Tokyo. The rain is falling sideways and the wind is whistling its way through the sea of vending machines, but inside the Makuhari Messe convention center it's warm and dry. That's good, because that's where the games are, and that's where we are, hanging out with Major Nelson and the crew from Joystiq. 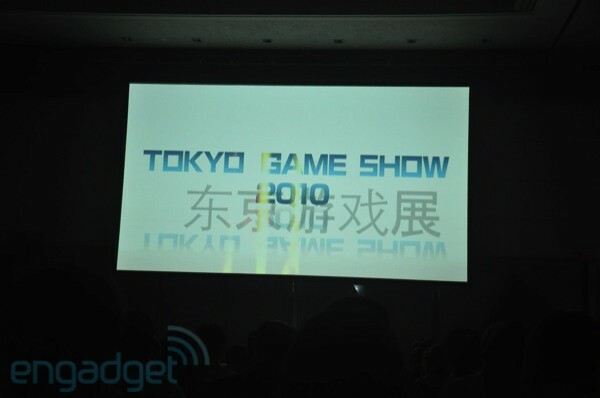 Microsoft is about to kick off the 2010 Tokyo Game Show and we have the blow-by-blow waiting for you just a click away. 10:34PM And we're done here. We also thank you for your attention. Ja mata! 10:34PM "Thank you for your attention." 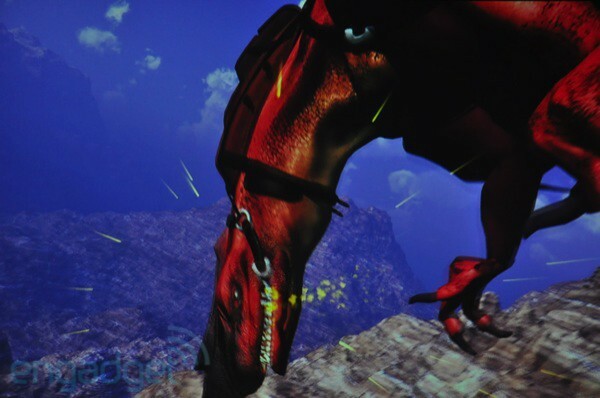 10:34PM "Japanese creators, innovative gameplay, and thrilling stories are very famous in the world. 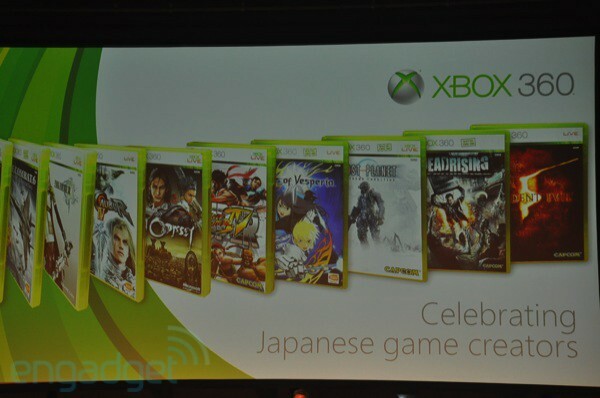 The Xbox 360 will support those creator more than ever, and the Japanese creators' unique experience will provide a totally new experience to gamers around the world." 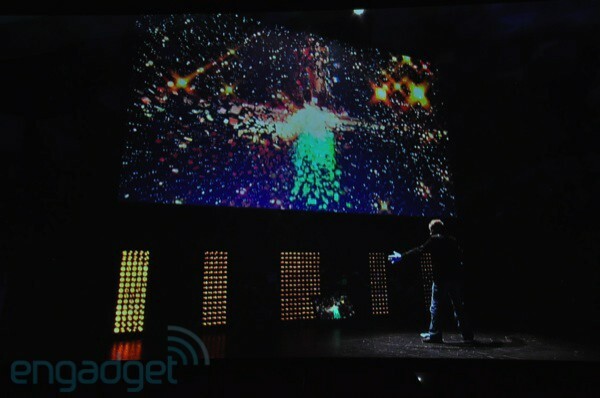 10:32PM Takashi Sensui is back, telling us that a new era is about to begin with the Kinect. Naturally. 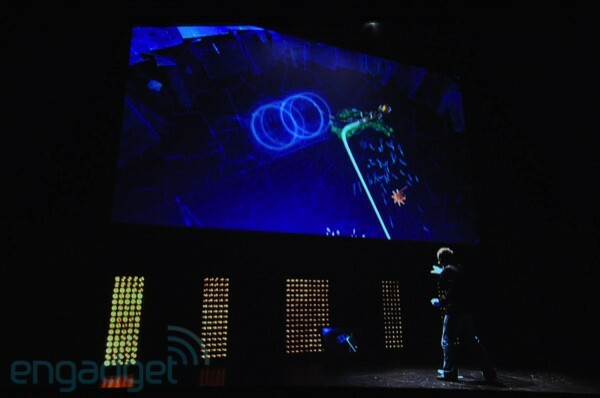 10:32PM We were also looking forward to getting another game out of our $200 Xbox peripheral, Keiji. What are you going to do about that? 10:30PM Kaiji's talking about the gigantic controller in the original games, and he says to "look forward" to learn exactly how this new game will be controlled via Kinect. 10:29PM Yes, and so too would this website be greatly changed without computers. 10:29PM He's mentioning that the vision of 2082 "looks too old" to us, and that's because of the disappearance of computers. "The world environment would be greatly changed." 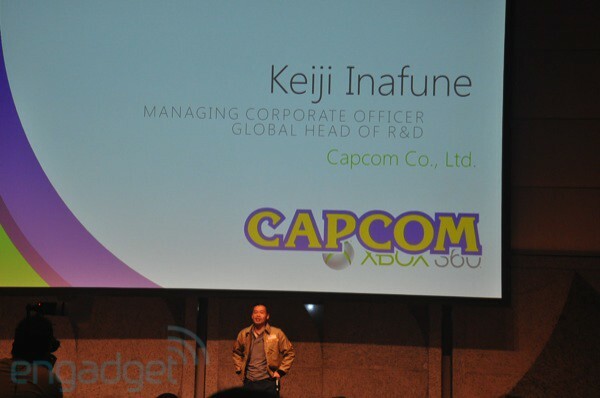 10:28PM Keiji Inafune from Capcom is talking about the game -- and his cellphone is running. "Not stylish at all, eh?" No, but your military jacket is pretty bitchin', Keiji. 10:28PM For a second we got excited about being able to dust off our giant controllers from the original Steel Battalion games, but then we realized this is a Kinect and so, therefore, shows blatant disrespect for physical controllers. 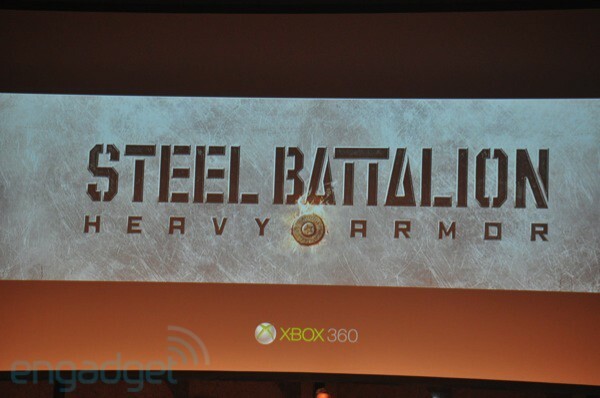 10:27PM Oh boy, it's a new Steel Battalion game! "Heavy Armor." 10:27PM This is a new title on display, which we still haven't been given the name of. 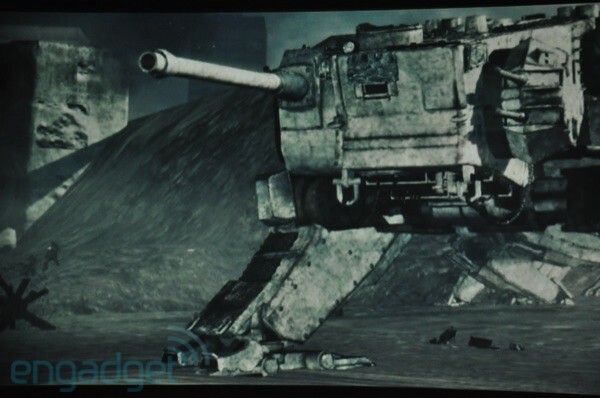 Walking tanks are stumbling their way onto the beach, Normandy-esque of course. 10:26PM Okay, another trailer. 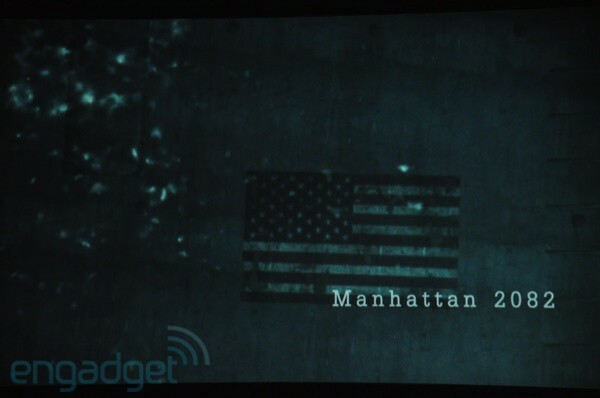 This one takes us to Manhattan in 2082, which looks a good bit like Manhattan of 2010, except with more war. 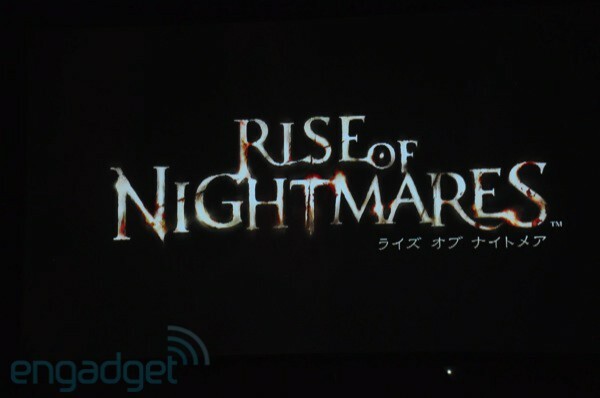 10:26PM Sensui himself doesn't know how this title will use Kinect to bring you into the horror genre, and can't wait to learn more. We hope he'll clue us in eventually. 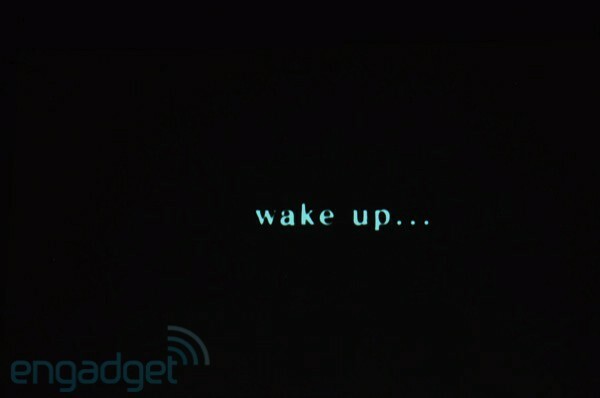 10:25PM This trailer invites you to "wake up to a new wave of horror" ... which honestly doesn't look particularly different from the previous waves of horror we've played through. But, you can only learn so much in a 30 second trailer. Coming sometime in 2011. 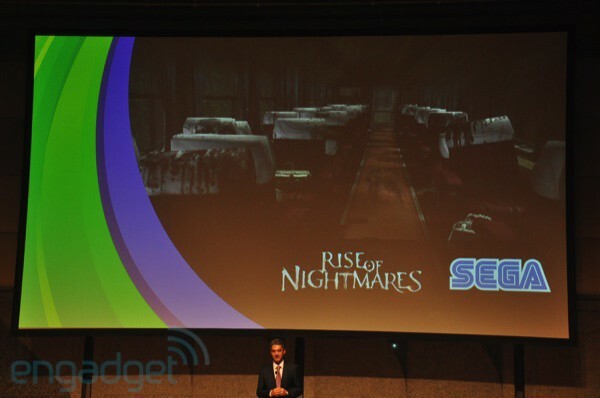 10:24PM Time for a little horror, "Rise of Nightmares" from Sega. Another trailer! 10:23PM He's saying they're working very hard until they can deliver it, but doesn't have a specific date for us -- you know, the "when it's done" story. 10:23PM He pledges it will be a "very challenging" title, and we hope that's not just thanks to the unique difficulties of playing fast-paced motion games. 10:22PM "It is a shooting game, but is to purify the world to make it happier. To turn it into a world full of hope with music." 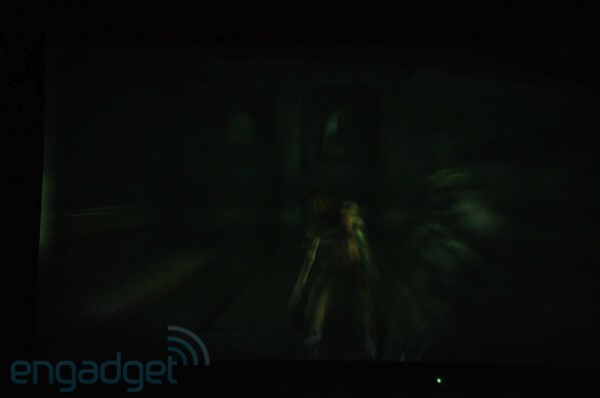 10:22PM Another is "matrix," which is more of a Rez-like view into space -- or something dark anyway. 10:21PM He's showing a few stages, including one called "beauty" that includes wind, the sky, light, and happy thoughts. 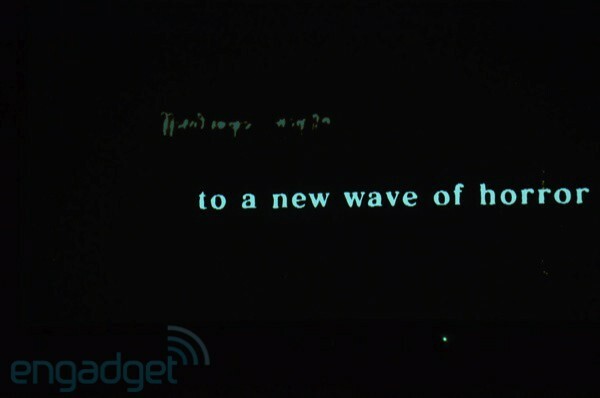 10:21PM "This is what I have been pursuing, the convergence of games, entertainment, and music." 10:21PM Tetsuya Mizuguchi from Q? 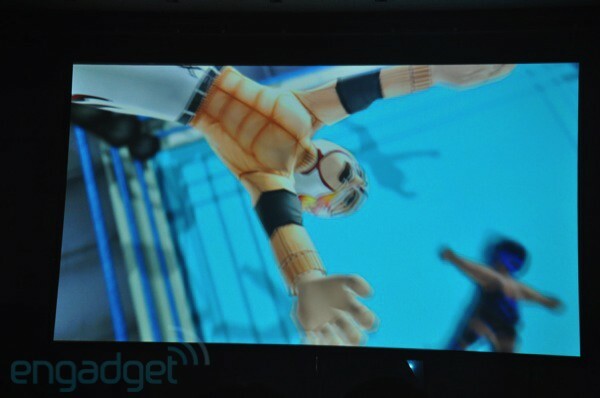 entertainment, producer of the title, is up to talk about the game. 10:20PM But, it certainly looks amazing enough to be worth standing up for. 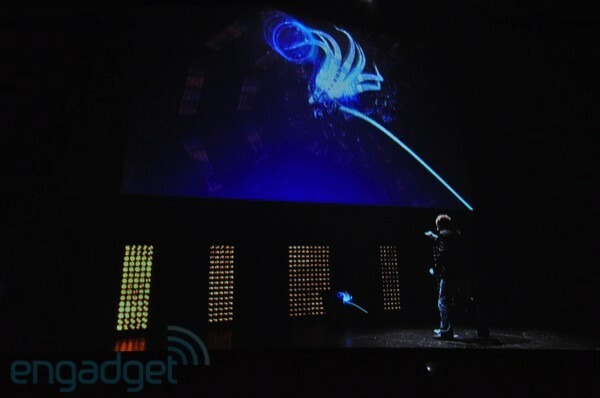 10:20PM The game is very much in the style of Rez, so much trippy motion controls you'd probably rather play this chilling on the couch than standing in front of your Kinect. 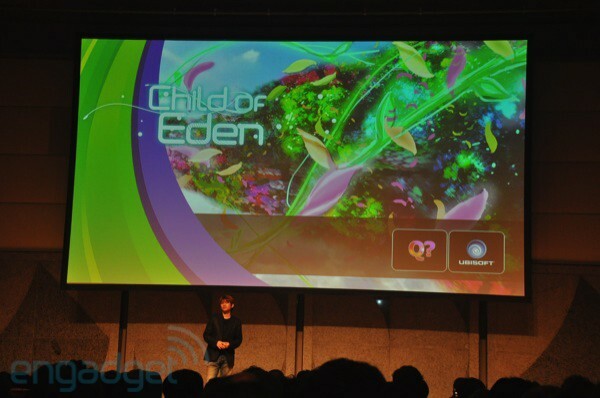 10:19PM Now, another trailer, this of Child of Eden with new footage. 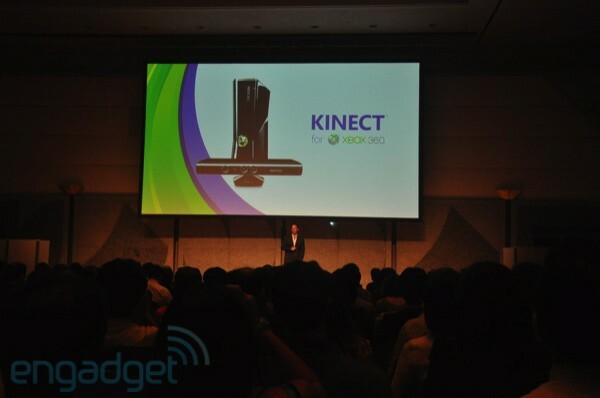 10:18PM The game was already confirmed as a launch title for Kinect in Japan. 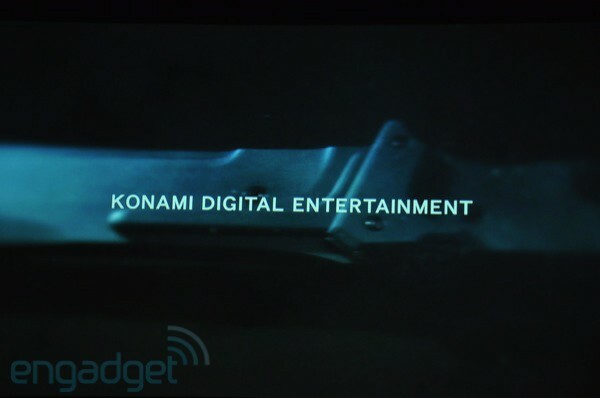 Now we're learning that gamers worldwide will be able to buy it sometime in 2011, published by Bandai Namco. 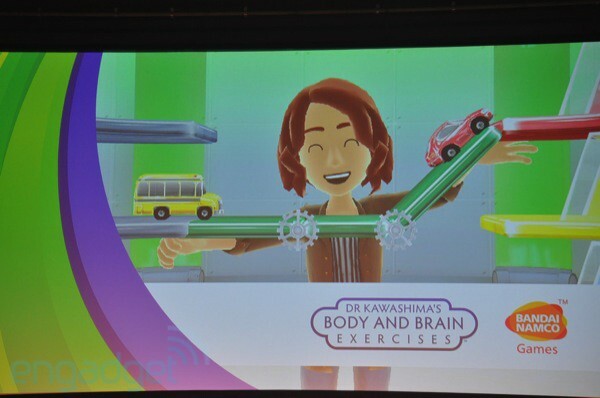 10:18PM Time for a few more reveals, including the confirmation of "Dr. Kawashima's Body and Brain Exercises," from the famous "Brain Training" games. 10:17PM Naturally that's music to Takashi Sensui's ears, who again runs MS's Japanese businesses and surely would love for a little more success for the Xbox 360 here. 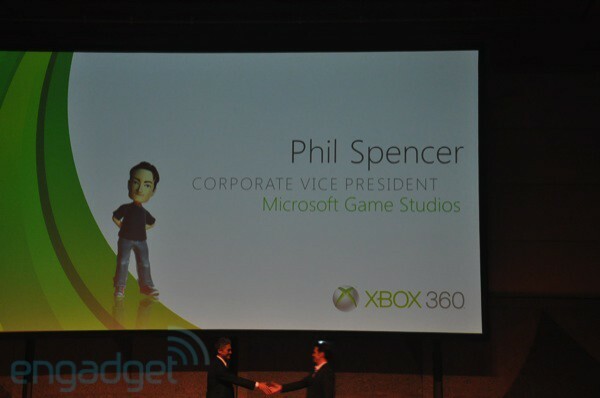 10:16PM Phil's back, talking about his commitment to "creating games the world wants to play." 10:16PM So, yeah, pretty much another typical game from Grasshopper Manufacture. 10:16PM We're at a carnival of sorts, populated by a bunch of dudes with goofy animal masks. 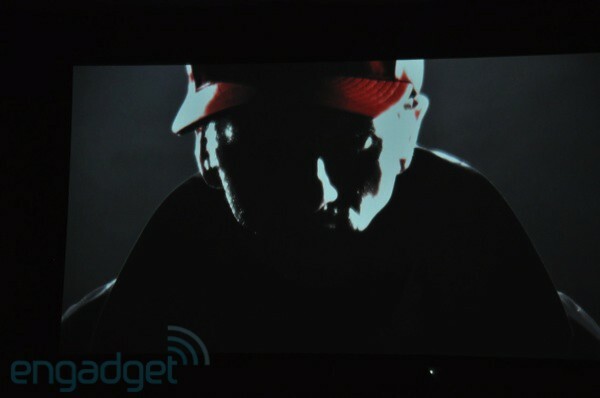 They're confronted by a baseball hat wearing protagonist who makes their heads explode by squeezing a flaming baseball. 10:15PM Lots of running, flashing, seizure-inducing cuts. 10:14PM Unfortunately he cannot give any details of the game, but you "will not be using guns or swords," which is something of a departure. 10:13PM What should we get them as a wedding gift? Oh, right, a Kinect developers kit. 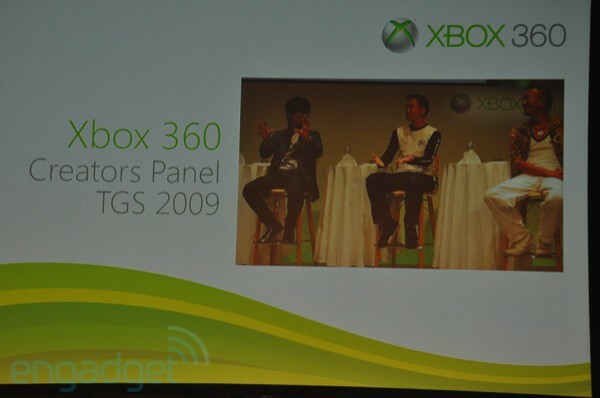 10:13PM SUDA 51 is making an announcement of marriage with Microsoft. We'd like to congratulate them on their impending nuptuals. 10:12PM These are the guys behind Killer 7, No More Heroes, and a variety of other truly intriguing titles. 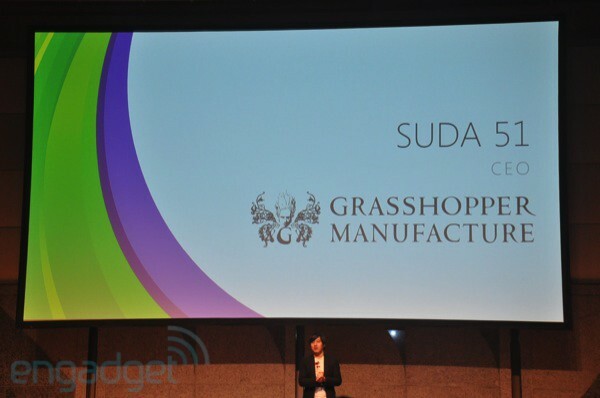 10:12PM Time for Grasshopper Manufacturer and CEO SUDA 51, whose name is so cool it must be typed with the Caps Lock button on. 10:11PM Alas, it never fired. 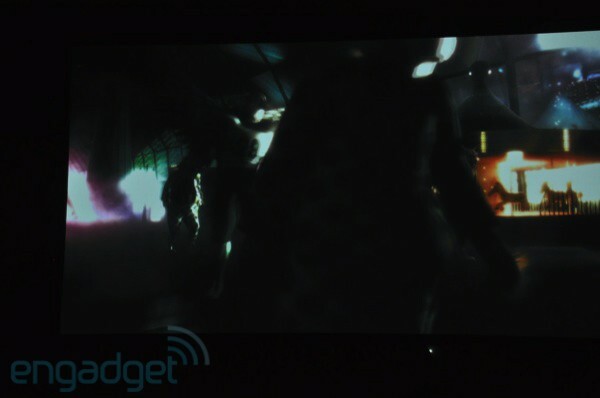 10:11PM Another 30-second, pre-rendered trailer that ends just as it's getting good. 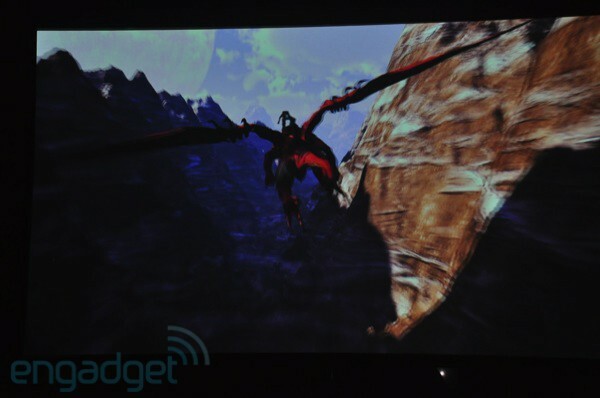 The big red dragon was about to shoot a laser out of its mouth, Panzer Dragoon style. 10:10PM Okay, they're pretty badass dragons, actually. 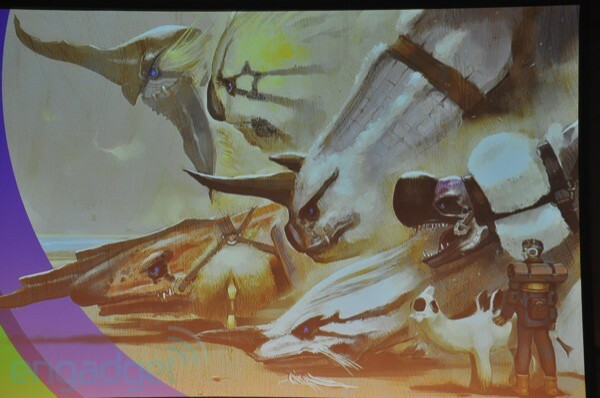 10:09PM The game is called "Project Draco," and it looks to involve riding a variety of monsters ranigng from silly winged alpacas all the way up to slightly less silly dragons. 10:09PM All translation inaccuracies aside, we think thinking about using bodies can be exciting too. 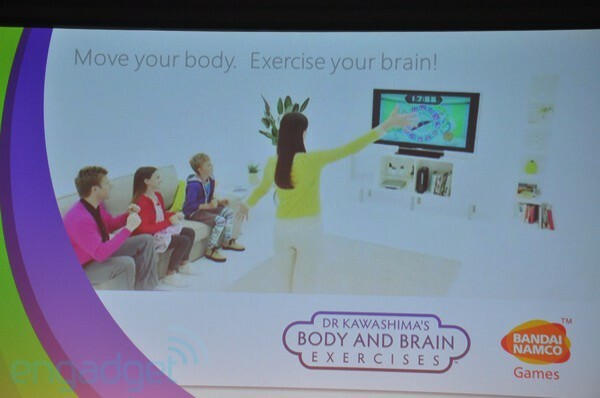 10:08PM "We wanted to create games for Kinect, and now we are working with Microsoft again... we can use our body, so thinking about new things is most exciting." 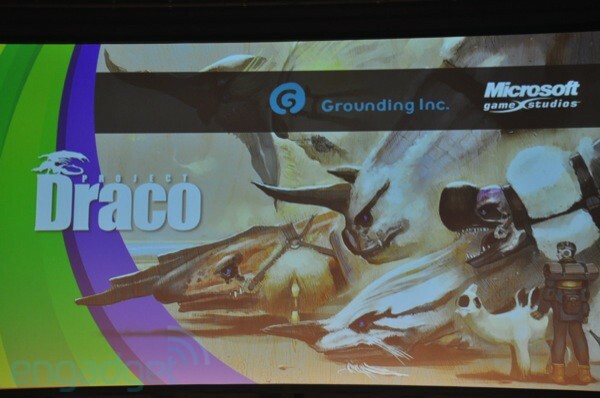 10:08PM Next up is Project Draco from Grounding Inc., the company of Yukio Futasugi, creator of Phantom Dust. 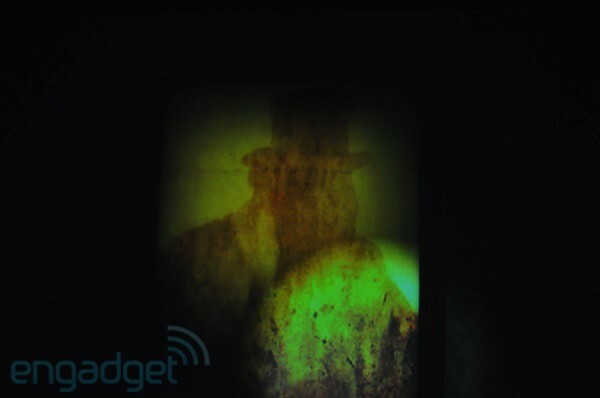 10:06PM "Haunt" is the game and, other than a 30 second trailer showing said ghost with said ugly teeth we don't know anything about it. It certainly doesn't look musical in nature, however. 10:06PM Trailer time. 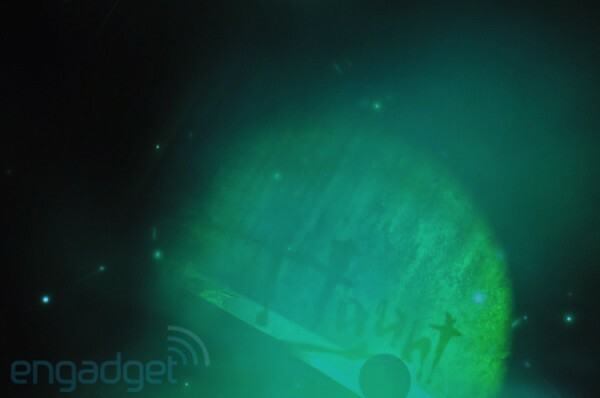 The game looks spooky... in a cutey kind of way, featuring ghosts with big, ugly teeth. 10:05PM Not a Parappa sequel? No Chop Chop? 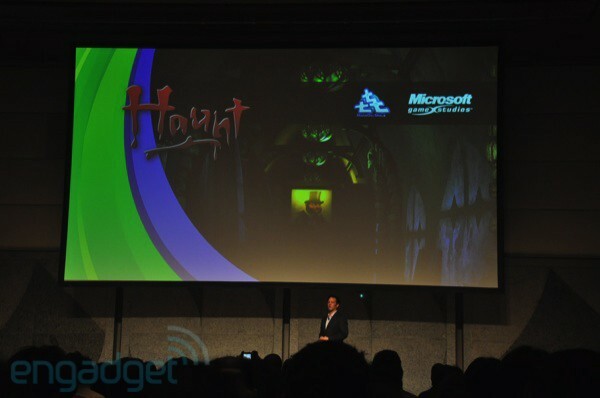 10:05PM Masaya Matsuura is talking about the current status of his Kinect game, a "game of horror." 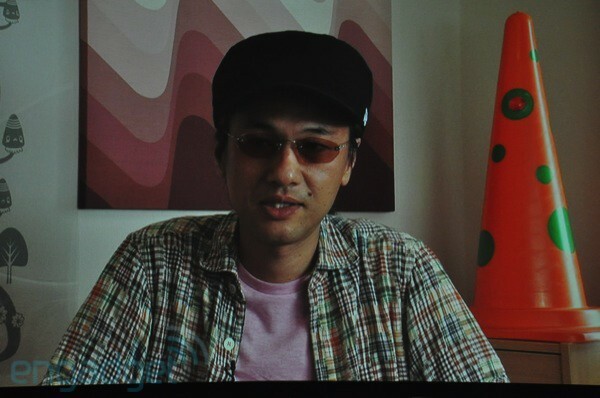 10:04PM Oh boy, a new title from NanaOn-Sha -- creator of Parappa the Rapper and, basically, the whole music genre. 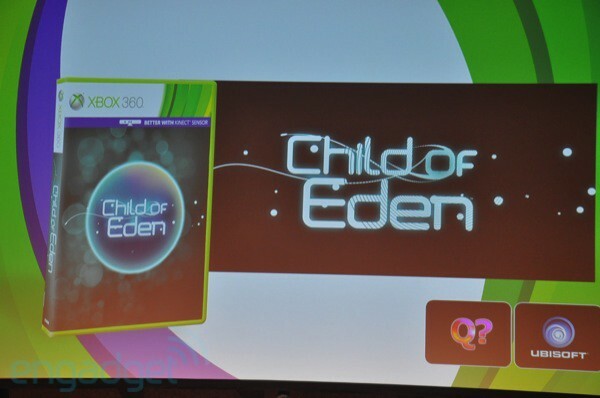 10:02PM Okay, it's Kinect time again, with Microsoft Game Studios tapping into an "eager pool" of creators here in Japan who will do cool new things with Microsoft's cool (?) new camera. 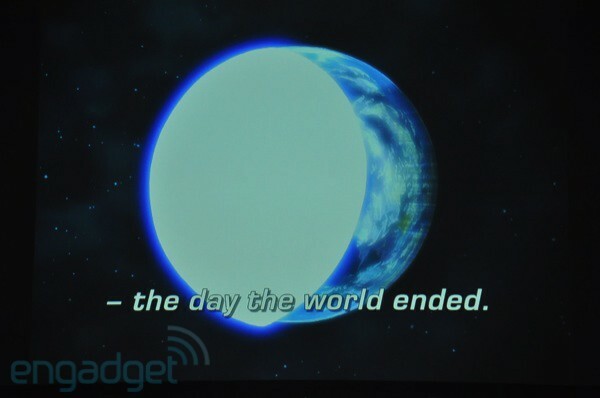 10:02PM Phil is mentioning you'll no longer need to pay too much for the Sega Saturn version if you want to play. Us? We already have one at home, thanks. 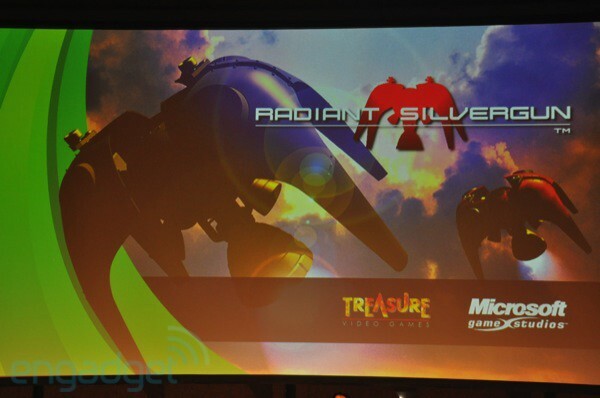 10:01PM It's Radiant Silvergun, coming to Xbox Live Arcade -- again next year. 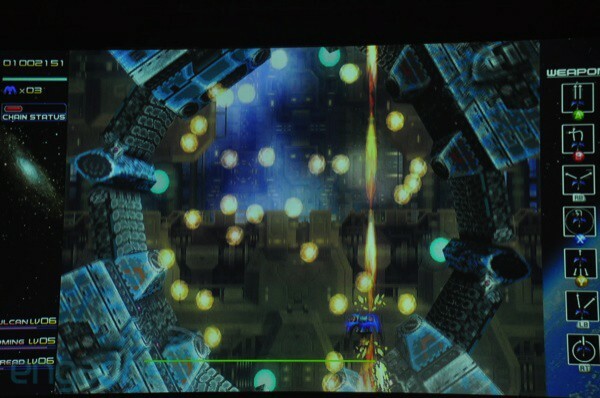 10:00PM Next up is Treasure, who will take us to the 26th century for some top-down, 2D Ikaruga shooting action. 9:59PM And yes, lucha libre masks will be available. 9:59PM Oh boy, get ready to rumble avatars! 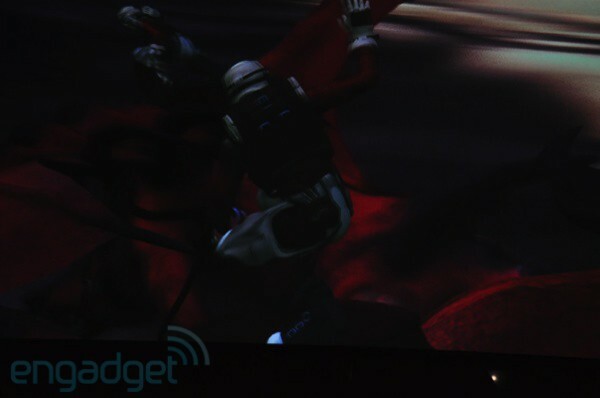 Fire Pro Wrestling for Xbox 360 will let you beat up the virtual representations of your friends when it launches in 2011. 9:58PM First? Spike, creators of the Fire Pro Wrestling series. 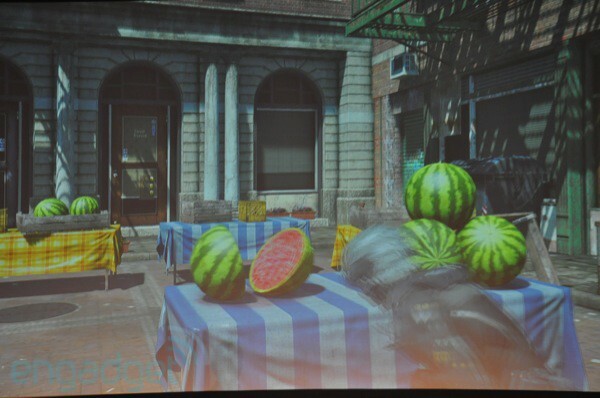 9:57PM "We know that Japanese artists create games the world wants to play." Five new partnerships coming, exclusive ones at that. 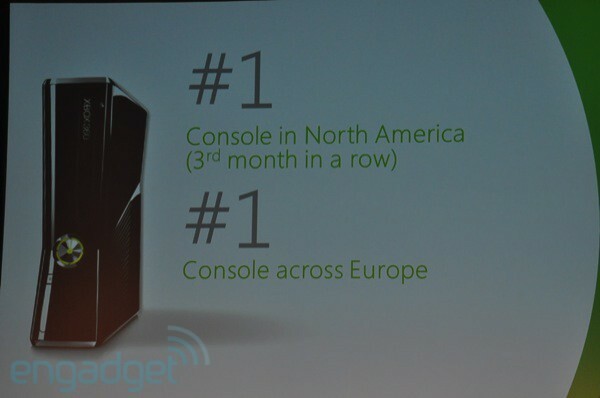 9:56PM And a sales reminder: the Xbox 360 is the best-selling console in North America for three months running, and is now numero uno across Europe as well. 9:56PM Phil is also mentioning that Zune launches here in Japan this fall, which certainly will be another attractive option for media fans. 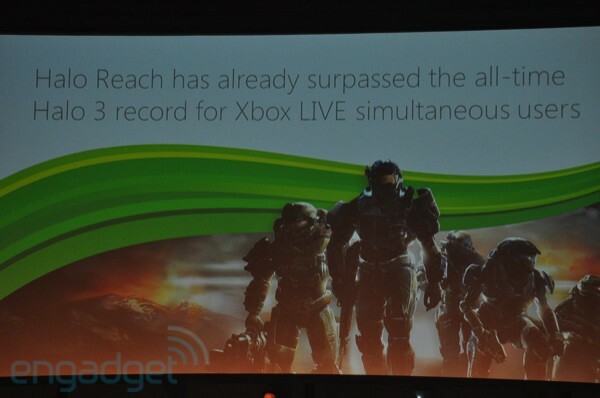 9:55PM Halo: Reach has already broken the one-day online participant records set by Halo 3. 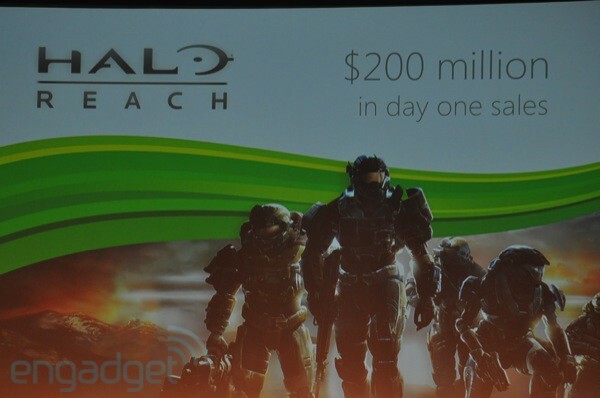 9:55PM Halo Reach, apparently. Selling $200 million in day one sales. 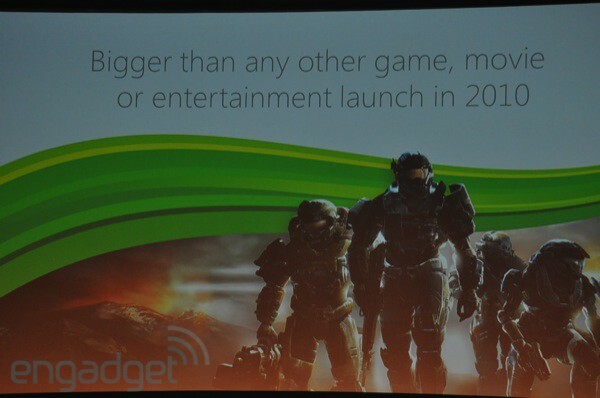 "That's more than any game, any movie, or any entertainment experience launched in 2010." 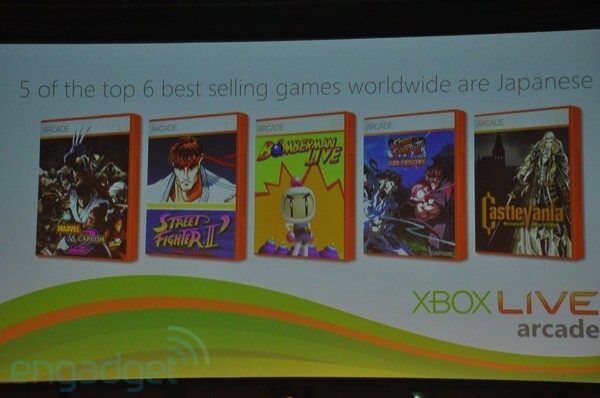 9:54PM Phil is also mentioning how many of the most popular Xbox Live Arcade games are Japnese in origin, including Street Fighter II and Bomberman Live. But, those are re-releases of greatest hits. What's next? 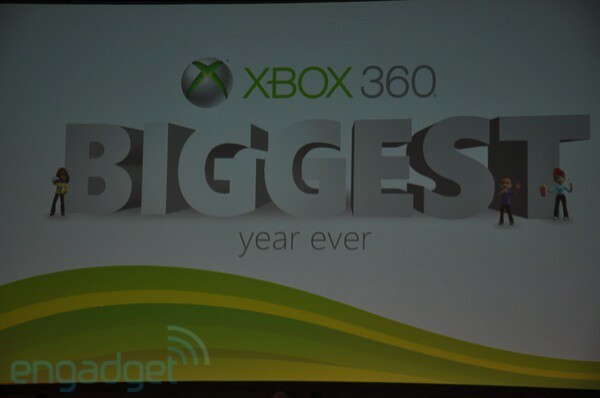 9:53PM Global sales of Xbox 360 games "continue to be impressive." 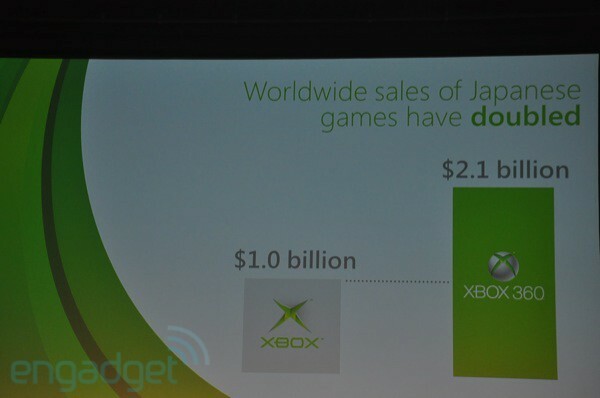 $2.1 billion in global sales of Japanese games, double the $1.0 billion from the original Xbox. 9:52PM Of course, you can still drunkenly stagger into any random building here in Akihabara and find some sort of coin-op entertainment. 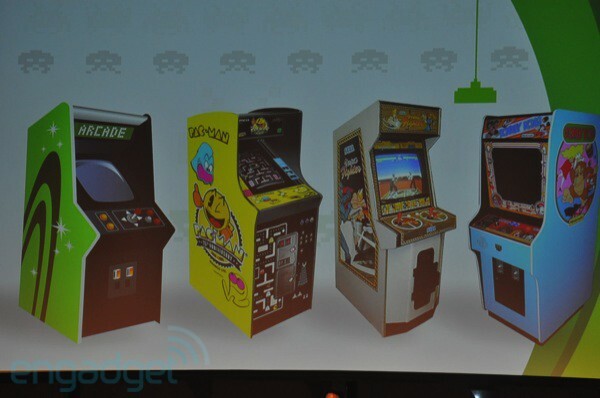 9:51PM He's trying to make gamers remember the "instant fun" of putting a coin into a gaming machine, but we're wondering how many American gamers even remember arcades these days. 9:51PM "Japanese games are the games the world loves to play, and they were born in the arcades." 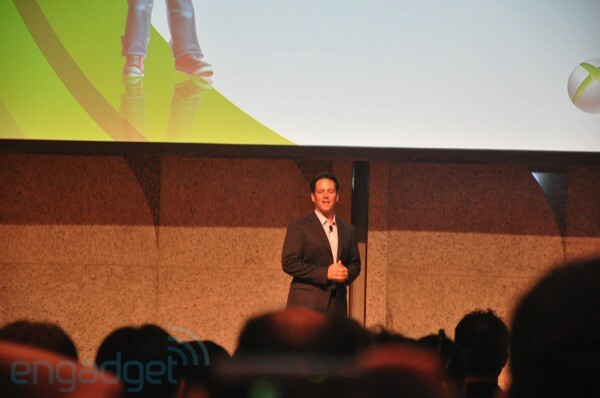 9:50PM Takashi Sensui is back, warming up the crowd for the next speaker: Vice President Phil Spencer. 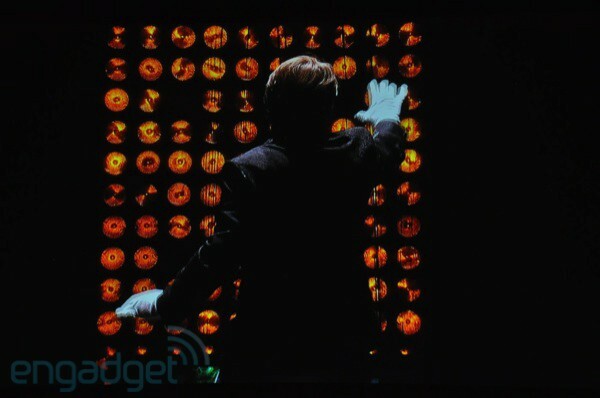 9:49PM Where once there was one robot, now there are two... and now they're dead, victims of Raiden's unbridled rage. Seems like his position is secure for now. 9:47PM Now juggling the bowling pins. He's stealing the show. 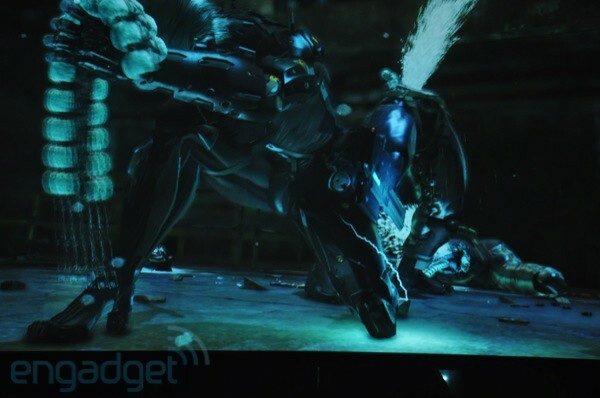 Maybe Raiden should take a back-seat in this sequel. 9:47PM Robot has skills! 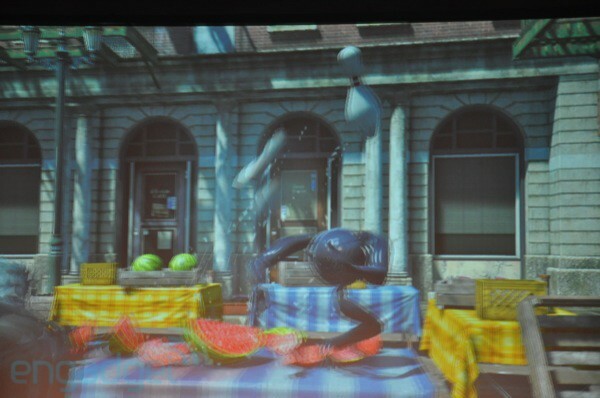 He's spinning the watermelon like a basketball! 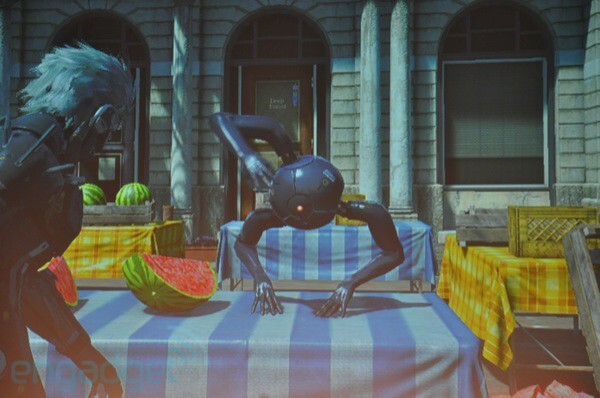 9:46PM Uh oh, the watermelon turned into a three-legged robot, an unmanned probe. 9:45PM Okay, watermelon time, sliced in two easily. Gallagher, eat your heart out. 9:45PM And, no, Raiden can't get a strike. Not even a spare. 9:45PM Kimura San is showing the "free cutting," where you can set your slice angle and "freely cut objects." 9:44PM First some bowling pins. 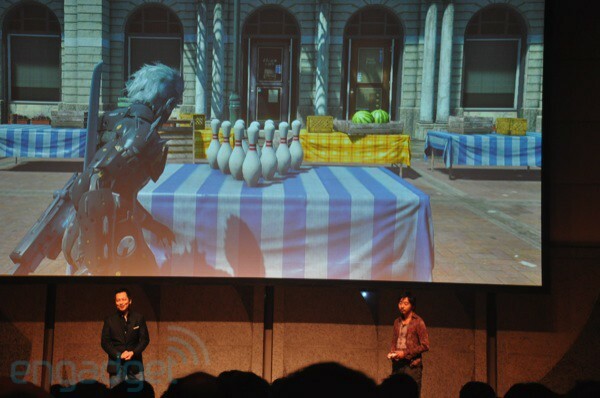 Can Raiden get a strike? 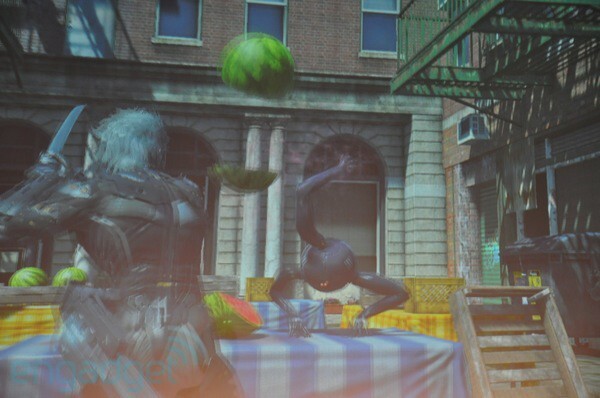 9:44PM In the lengthier trailer, Raiden slices a watermelon into pieces. 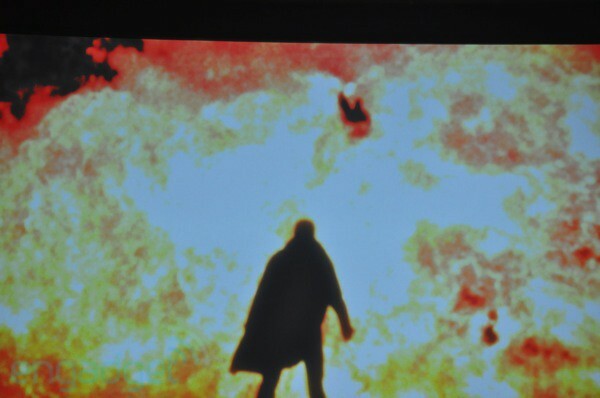 Now it seems like we're going to see it live, done by Mineshi Kimura, Creative Director. 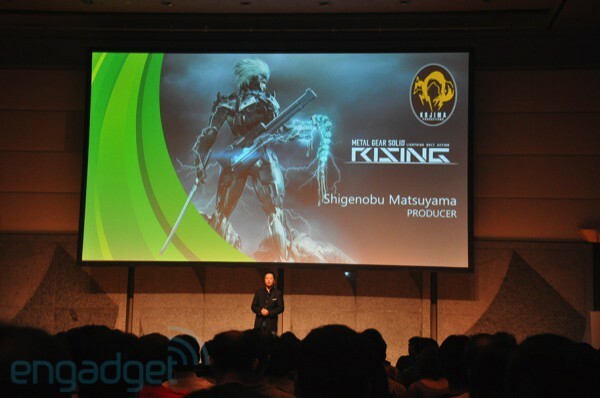 9:43PM Shigenobu Matsuyama, producer of Metal Gear Solid: Rising is on-stage talking about the game. 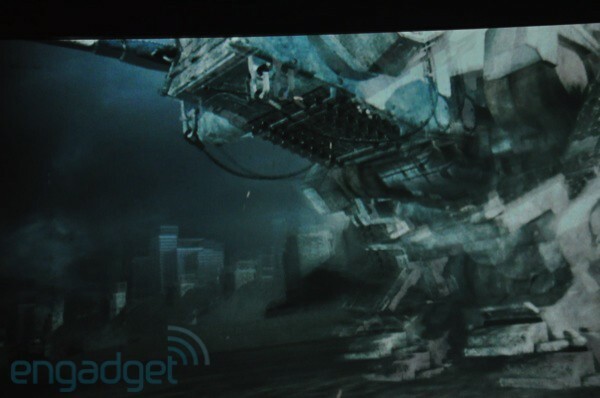 This is the "short" version of the trailer we've seen, but now we're about to see a "surprise." 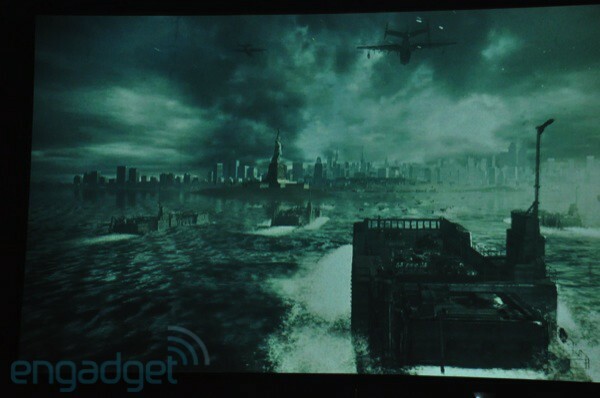 9:42PM Scratch that, it's the E3 trailer again. 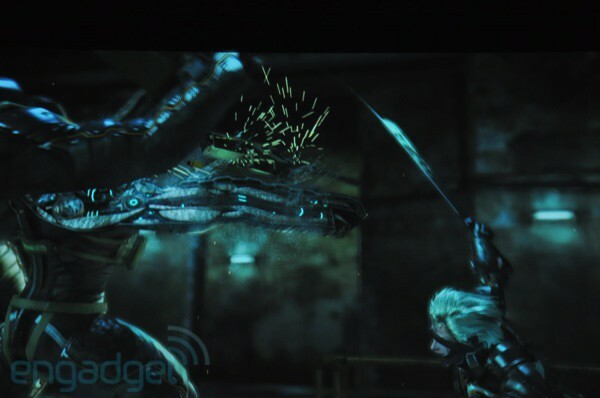 Raiden doing his thing, slicing dudes into bits. 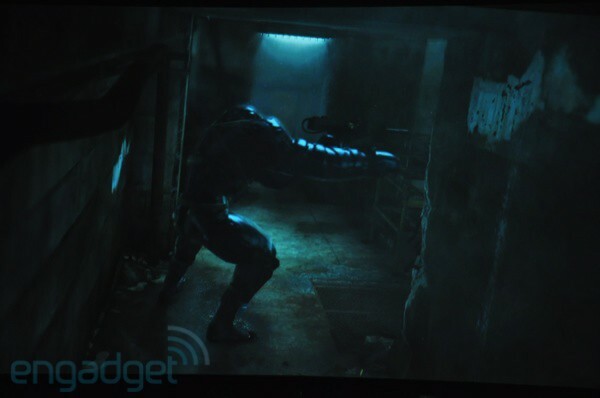 9:41PM Time for a new trailer from the Xbox 360 Metal Gear Solid installment, a fresh render from Kojima Productions. 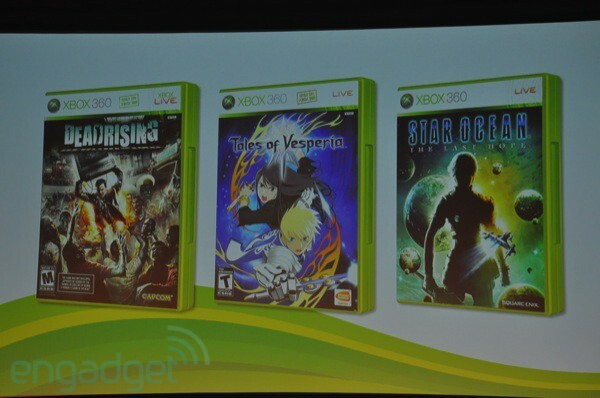 9:40PM "These games will define the future of Xbox 360 and Kinect, and we believe that these will lead us to further success." 9:40PM Okay, enough about the past success of the console, now time to look forward. We're about to see 10 titles currently under development by Japanese creators. 9:39PM First Kinect name drop. 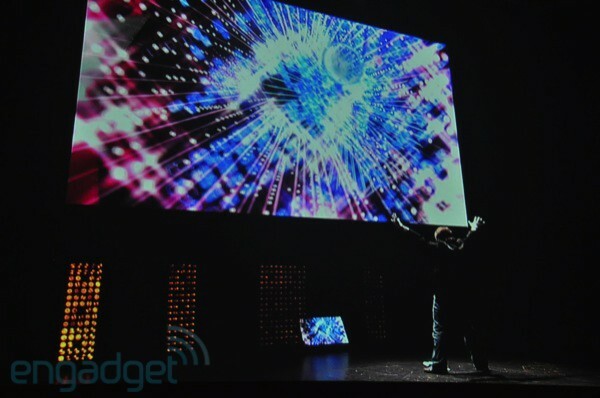 If you're playing keynote bingo, circle gets the square. 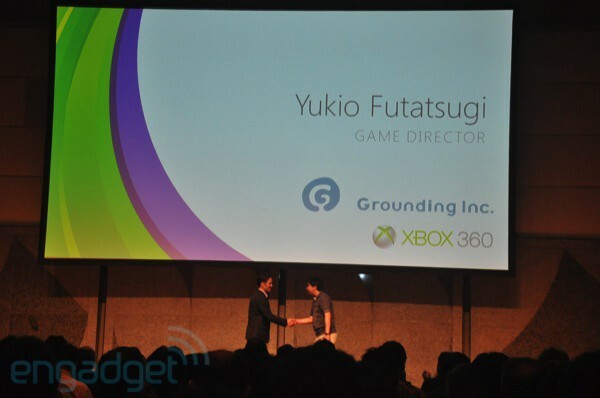 9:39PM The strength of Japanese game creators will be a vital part of that continued success. 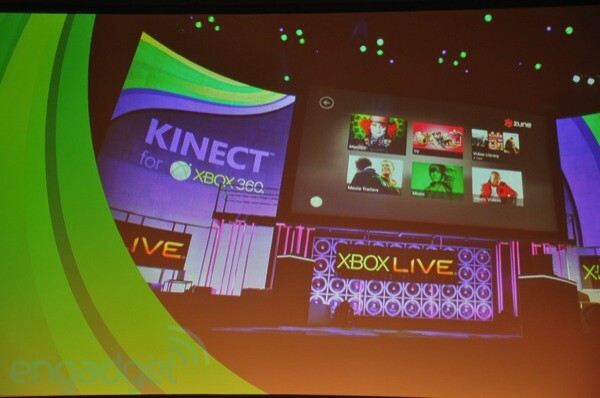 9:38PM The Xbox 360 is "one of the most creative and potentially profitable" platforms. That's certainly the case, especially looking at recent US console sales. 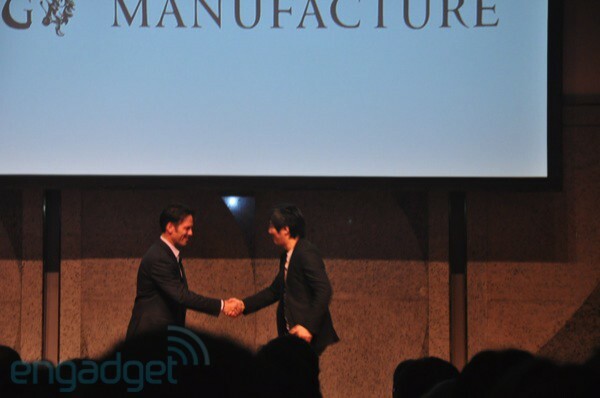 9:37PM He's naturally honored to be here, and is introducing the "world's finest games" for Japanese gamers while also looking to bring Japanese games to the rest of the world. 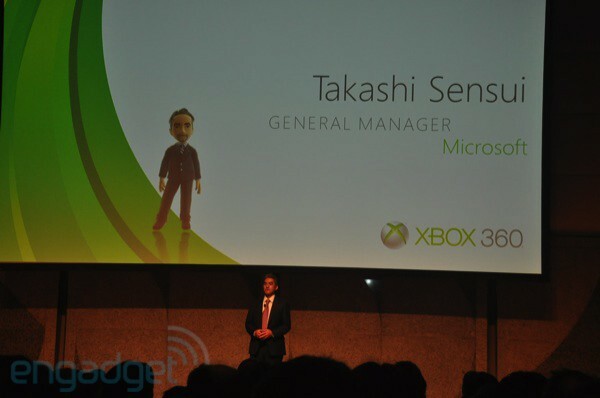 9:37PM First up is Takashi Sensui, GM at Microsoft and head of Japanese efforts. 9:36PM This year's TGS mascot is a bizarre looking robot/anime girl. She's featured prominently in this into, receiving some... polite applause. 9:35PM Lights are down, blasting intro is starting, it's party time! 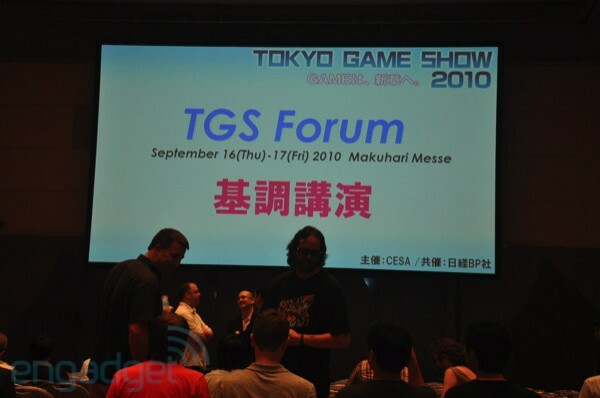 9:30PM There have been some major announcements made at previous TGS keynotes over the years, including Nintendo first revealing the Wii Remote and Sony the Dual Shock 3. 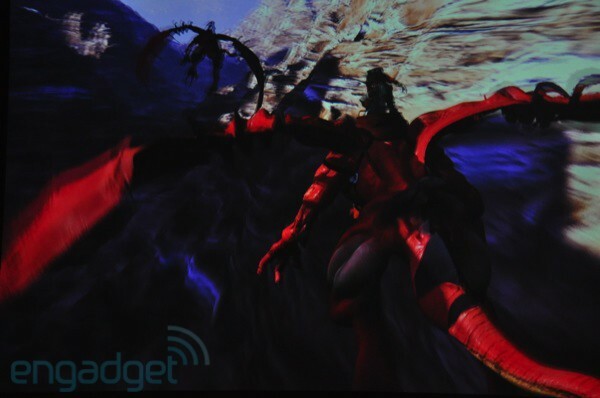 Could we see a whole new controller today from Microsoft? 9:28PM Auto-translating earpiece installed. 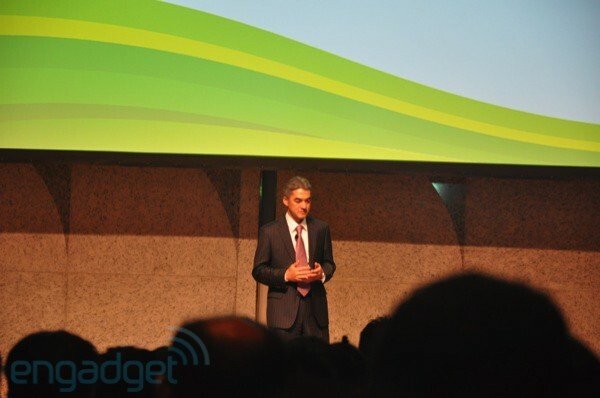 We're expecting a bilingual conference this morning, but we'll only be updating in English. It's okay, you can call us uncultured if you like. 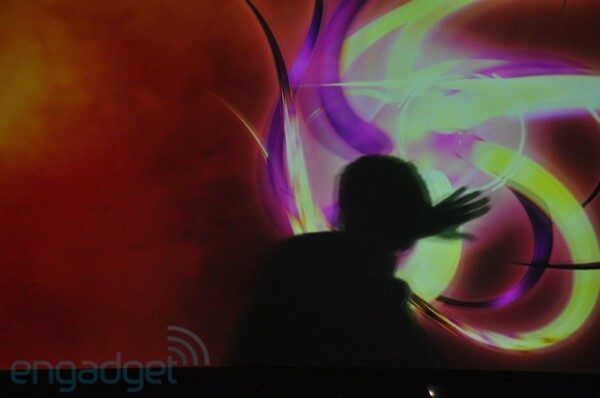 9:27PM Kudo Tsunoda, "father" of the Kinect, is in the house. 9:24PM Okay, we're in our silver velor seats listening to some truly, truly awful muzak. Things are getting a little more busy, should be starting soon.